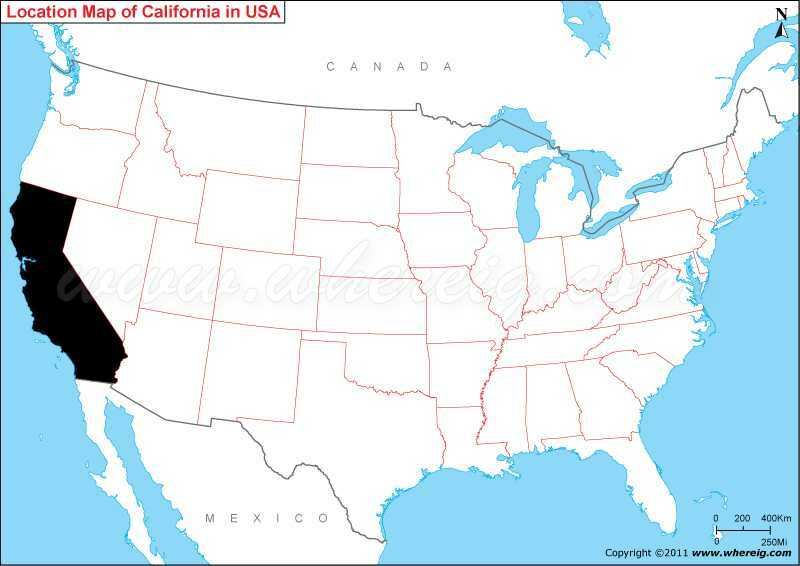 Map showing location of California on the US map. California is the third largest state after Alaska and Texas and most populous state of the US. You can find the geographical location of state on the given map of California i.e. California is located in the south-western part of the US bordering with New Mexico in the south-east, Nevada in the east, and Oregon in the north. However, in the southern part, it shares international boundary with Mexico and entire western part it shares coastline with Pacific Ocean. Could you find some of the world’s famous cities on California state map i.e. Los Angeles, San Francisco, San Jose, and San Diego? These are highly advanced cities of USA and known to everyone in the world. Business tourists and other tourists love to visit California. However, its capital city is Sacramento which is located in the central north of the state. The given California map portrays the major and other cities along with roadways and railways of state. California has very diversified climate and geography. It has some of the significant mountain ranges i.e. the Pacific coast in the north and west and the Sierra Nevada mountain range in the east. Its eastern and south eastern part has also desert region; most known is Mojave Desert areas lie in the southeast. North-west region has forests i.e. Redwood-Douglas fir forest. The state’s highest point is Mount Whitney and the lowest point is Death Valley. Interestingly, the central region is dominated by Central Valley, which is one of the most fertile regions of the world. The interesting and surprising fact about the state is - If we consider California as a country then its rank would be among the ten largest economies of the world and its GDP tantamount to Italy.